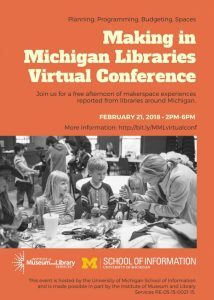 It’s been a couple weeks since our workshop at Houghton Lake ended – but we are still riding high off the thrill of our interactions with the educators and librarians we met there. We were so pleased with how the workshop went, and with the great ideas that were shared there. We loved the energy of our participants, and their willingness to engage deeply with ideas. The small size of the group allowed for personal conversation and relationship-building and networking with participants. We expect that the great relationships and enthusiastic attitudes we saw during the workshop are going to translate into some exciting new maker initiatives in local schools and libraries! One of the many highlights of this workshop were the small group activities. We were particularly impressed with the thoughtful, thorough designs we saw during the design-a-bag activity. The board game activity also allowed the groups’ creativity to shine. A huge thank you to the Houghton Lake Public Library and our hosts Sarah and Kimberley, and to all the amazing folks who attended and helped make this event a success!